THEY CANT KICK US ALL OUT!!! HURRY UP AND BUY. THIS IS YOUR ONLY CHANCE. 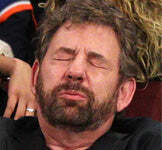 JAMES DOLAN HAS RUINED OUR BELOVED NEW YORK KNICKS. Imagine the look on his face when every person in Madison Square Garden wears this shirt. SUPPORT YOUR KNICKS SHARE THIS TO ALL KNICK FANS.